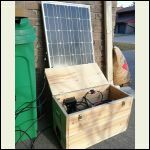 Small Cabin Forum / Off-Grid Living / Very basic solar set up question. 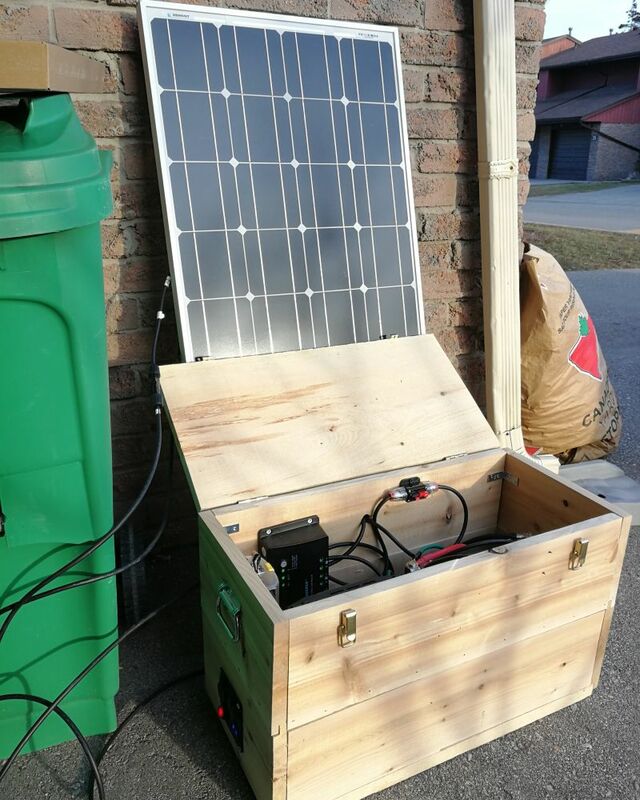 Im building a very small 8x12 cabin for camp and I have the pieces to set up a very simple solar power system. I currently have 2 50 Watt panels, a 12V battery soon to be 2, the charge controller, and a 500W Power inverter. Id like to run wiring to just have 1 exterior light with switch, 1 interior light with switch, and possibly one outlet. I cant find much information on running wires using and hooking them up to an inverter so im hoping someone cant point me in the right direction. My suggestion is to use a 12V led lamp found in the automotive section for your exterior light. These are durable and waterproof plus not going through the inverter is more efficient. Your inverter already has two 120v sockets. I would just plug in a hanging lamp or wall lamp with an led bulb. 7w bulb gives you a lot of luminescence. The other socket I would put a power bar for other items. Get a power bar with a switch to turn off any ghost draws when items are not in use. Lucky you to have usb plugs built in, that's where you can charge your phone or even some usb charging flashlights ect. 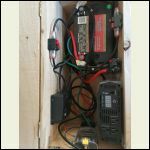 You don't need much in the way or wiring except if you are talking about your panels and battery. Can't help you there, my kit was handed to me ready to plug n play. Agree with Wilbour but go one step further - with such a small system I would keep both lights 12VDC and keep the inverter off unless you specifically need 120AC - the idle draw on the inverter will be an unnecessary load on your battery (this is assuming you don't have something 120 that you need all most of the time that you did not mention). Many Charge controllers have a Load lead for small 12v loads that could be used for the two lights. This has the advantage that should they run down the battery too much, the CC should shut them off with a built in low voltage cut-off (again, check your CC). Whether running directly of the CC or the batteries, you can pick up a combined fuse/switch such as Breaker Switch or just use cheap inline auto fuse and DC switch. (the link I used is a local (and online) place near me that I used for many of my components). If the inverter must be on to use the USB ports then this is another big waste of idle power - better to add a couple 12V outlets and use the lighter type 12-USB adapters. Careful selecting the wire from the batteries to the inverter - make sure you use a large enough cable to safely handle the maximum load - and don't forget the fuse between the two. One last thing - sometimes it is cheaper to just get regular light/lamp housings (120V) but buy regular size but 12V LED bulbs. This will give you a larger choice of lights/lamps if you care about that. Just a thought, but during the building process, I would suggest wiring the place with #12 AWG romex with future plugs and lighting places marked for 110/120v plugs and lights. It is so much easier to do this now rather than later and the cost should be minimal. You mention getting a second battery so I assume these will connected in parallel to keep the system at 12v. I hooked up wiring from my inverter to a small Square D distribution panel with breakers using one outlet from the inverter to the distribution panel. This gave me 110/120 house power subject to various limitations. Wil and Raz make good points. These are all useful points thank you. I think using the 12V from the battery to the lights is the best option for what my set up will be but wiring for future 110 would be a smart idea. Beachman would you happen to have a picture of your set up with the distribution panel available? That sounds like the set up I was looking for when I made the post and Id love to see how you did yours it sounds like it could be good for a future set up if I decide to go with more panels at some point. And raz if you have any more detail on the fuse set up you could share I would appreciate that as well. Here are a few images of the box I built for essentially the same reasons. 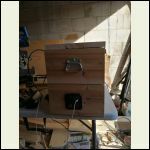 My first objective was to have a portable system for the building of my site. 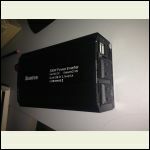 It has done pretty well in that regard for keeping batteries charged on wireless tools, phones and such. Much like suggested above its a good idea to run through a few fuse and breaker lines. This year I will be changing it to a fixed setup at the cabin. Adding in lights, a 12V pump and fixing my panel is a set location. However the fuse panel was really cheap on Amazon, plus the breakers and such are really cheap. With that small of a system you want to avoid the use of the inverter as much as possible and stay on 12V.... which is why I will be doing my cabin lights on the 12v wiring with LED only lights. Thanks Meloj this is actually a perfect set up to get me started. Of course I forgot about the fact that I would be needing power out there during the building process haha. Would you be able to send me the link for the panel off amazon you went with or even just the brand name? I can send you all the parts and pieces I used. Really I knew nothing about electrical but watched like endless youtube videos, talked to people and did a ton of digging on this site here. Rory, I will try to scan and send plans on Monday. I have 2 pv's generating just over 500watts. From there about 45ft to a Blue Sky MPPT cc. 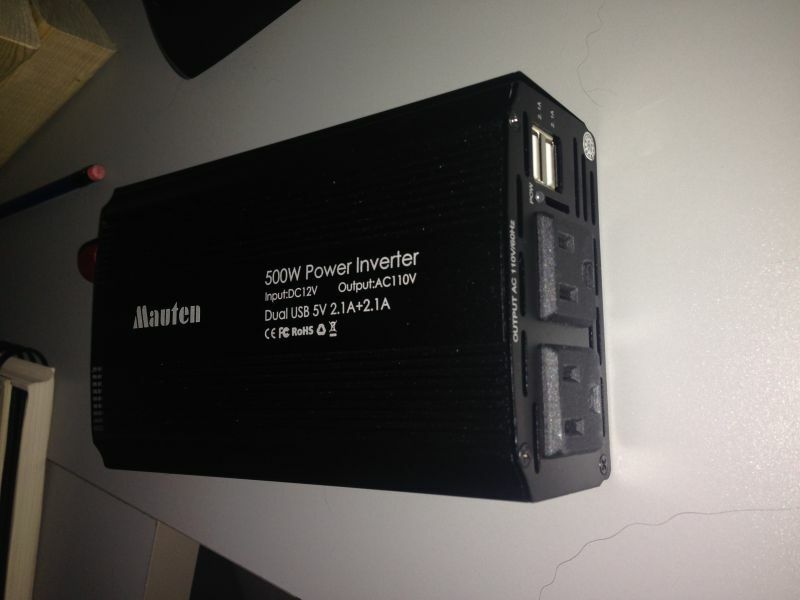 The pv's create about 30 v but the cc drops this down to charge 2 6v 370AH batteries in series for a 12v system. From there, to a box with a 30A breaker that controls the cc, a 20A breaker for a 12v water pump, and a 125A breaker for the line to the inverter. Used mostly AWG#1 for short run from batteries but kept batteries ouside to vent. Whole system is grounded and a shunt is used to drive the Trimetric battery monitor. I have a Delta SPD at the pv's and Trimetric (I think?) In the first box. From there, to the 1000watt PS inverter, then from one plug in the inverter to the Square D distribution box with 4 cicuits so far - 15A breakers on each circuit. I have about 6 outlets and a nice light with a conventional switch in the bathroom. 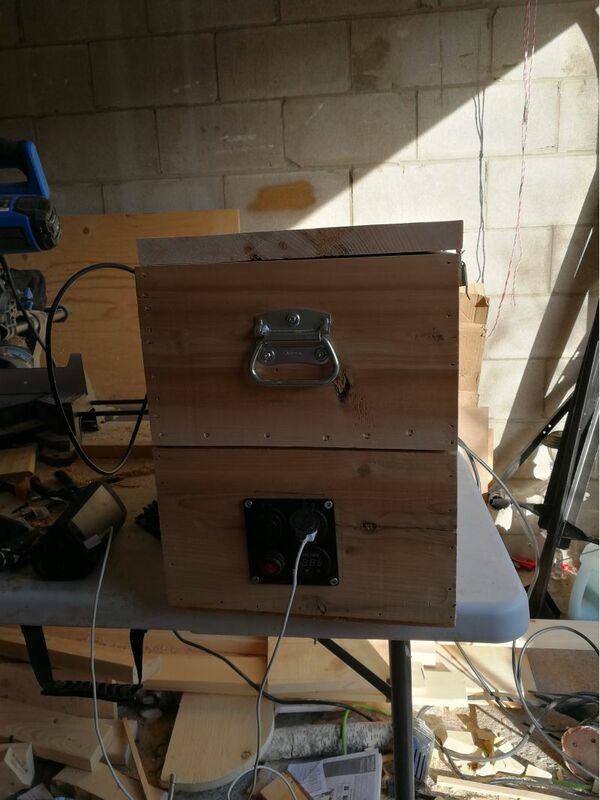 It was designed for about 750 Watt Hours and so far, so good. We have a small vacuum, a couple of table lamps with LED bulbs, a sat. radio, cell booster and the gas stove is plugged in to spark the burners and oven. It also runs a coffee grinder and a small hand blender. It is a light system. The reason I say to run wires now is because I did not and had to crawl around under the house and snake a lot of lines later. It all worked out but would have been so much easier during the build. I am on 11 th year with my super small system . 1 110 volt circuit with a 15 amp breaker (40$) to a ground rod cercuit20$ . I turn off the inverter when not in use so there is no idle drain. total cost about 275$ .I have replaced the battery once in 11 years. Thanks Just that sounds like just the kind of thing i'm looking for. Do you have any pictures of your set up? Its easier for me to follow if I can see it for myself. I'm mostly struggling with the 20 amp fuse before the charge controller and how the split looks coming from the battery to 15 amp breaker with ground rod. no pick every thing is spred in different location so one pic is not possible but i will try next time i go . The 20 amp fuse is just a 12 volt 20 amp in line auto fuse holder and fuse . Sorry, downloaded the file but forgot how to attach. Took me 2 years of research to figure it out. Still learning. 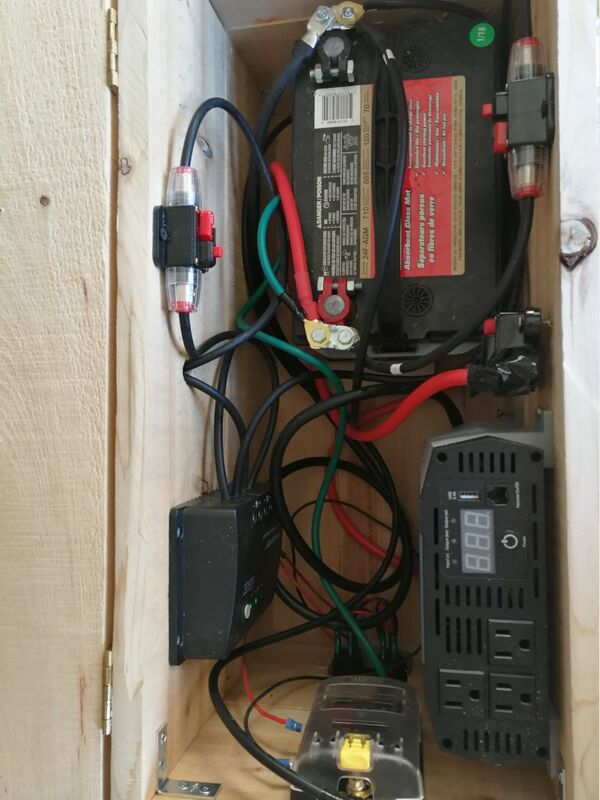 I have been customizing a golf cart for the first time and have a voltage reducer to a fuse block and everything is connected to the fuse block via hot then grounded which keeps the system 12v. Would this kind of thinking work to light and power a small tough shed turned cabin.